"This place gets overrun, game over." XLrator Media has released an official trailer for sci-fi action thriller Incoming, from newcomer director Eric Zaragoza. 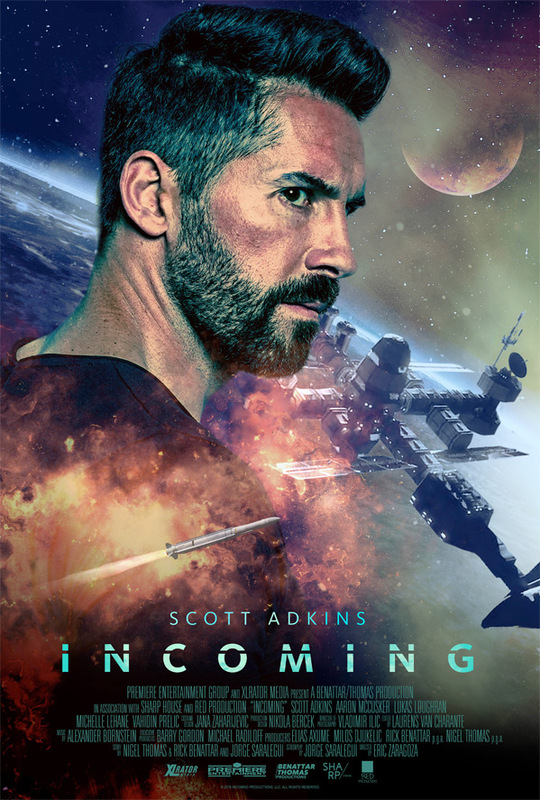 This action space prison movie stars Scott Adkins as a rogue CIA agent who has to fight bad guys to save the International Space Station, which is now a prison, after terrorists take over and turn it into a missile aimed at Moscow. It sounds crazy, looks crazy. The cast includes Aaron McCusker, Alaa Safi, Milorad Kapor, Dominic Power, Michelle Lehane, Arkie Reece, and Lukas Loughran. Surprise, this looks pretty dang bad, but we knew it would, right? Haven't we seen enough of space prisons, after Lockout copying Escape from New York? I guess not. Well, jump in. The International Space Station is now a prison -- the ultimate black site. No one's getting out. And no one knows it's there. But when the imprisoned terrorists take over the Station and turn it into a missile aimed at Moscow, only a shuttle pilot and a rookie doctor can stop them. Their task is complicated by a rogue CIA agent (Scott Adkins) who has his own plans for the station and the terrorists within. Incoming is directed by filmmaker Eric Zaragoza, an experienced assistant director who is now making his feature directorial debut with this, after a few shorts previously. The screenplay is written by Jorge Saralegui, from a story created by Rick Benattar, Jorge Saralegui, and Nigel Thomas. XLrator Media will release Zaragoza's Incoming in select theaters + on VOD starting May 4th next month. Your thoughts? Maybe a fun watch?